A partially-sighted man has had his full vision restored following stem cell therapy. Russell Turnbull lost most of the sight in his right eye 15 years ago after getting sprayed with ammonia while trying to break up a fight. The 38-year-old suffered from cloudy vision and was extremely sensitive to light but is now hoping his vision will be much improved thanks to the therapy, which sees cells taken from the good eye to help repair the affected one. Mr Turnbull is one of eight participants undergoing trials of the therapy, which was devised at the North East England Stem Cell Institute in Newcastle. So far, all of the individuals involved have reported reduced pain and better vision, and researchers are hoping this will be the case during a larger trial of 25 people. "This has transformed my life, my eye is almost as good as it was before the accident," Mr Turnbull said. "I"m working, I can go jet-skiing again, and I also ride horses. I have my life back thanks to the operation." 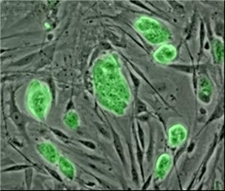 The North East England Stem Cell Institute draws expertise from the region"s universities, NHS Trusts, the Centre for Life and the regional development agency One NorthEast.